Reviews For PodKISSt/THE KISS ROOM! If you're a KISS fan, or just a fan of classic rock, check out this podcast. These are real people talking about their love & memories of KISS as well as updating others of upcoming events. Check it out! Best KISS Podcast Out There!!! By Nate....You know who I am!!!! Just heard #146, and I LOVE it! The Demon Rap is an INSTANT classic, and I love the talk about the KISS KRUISE!!! This show brings all things KISS to the forefront of American culture, with heart and comedy! Always worth a listen!!! This is the 3rd podcast I ever subscribed to and still one of my favorites. Ken and Gary have a true passion and fandom for KISS that will amp up even the most hardened critics of the band. Celebrating all eras is a must for me and they do it very well. Thanks for a great show guys! The only Kiss podcast that could be a TV Variety show ( about Kiss of course) Conversation, music, constant tribute bands live, and the infamous, Matt Porter! Great stuff and what a nice guy with a real "radio voice". You don't get that often on a podcast. Always great Kiss talk, always a fun listen. 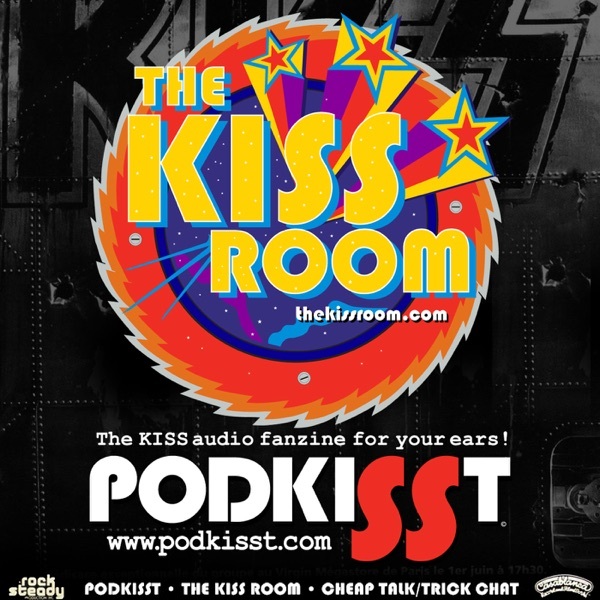 I've been a listener of Podkisst for nearly a decade and of the KISS Room for 6 years. Without Ken and Gary (and Ferk early on), I never would have gotten into podcasting. And Matt's enthusiasm for the band is contagious. Long live the Hottest Band in the World and Podkisst! Crazy, crazy podcast on ALL things KISS with excellent & proffesional production quality. I love hearing the lengthy discussions over the bands discography, backstage stories, rumors, history, book releases, & memorie's from all sorts of fans plus the humor. The excerpts of concerts, interviews, & news broadcasts are a plus too. It's also made my work day way more entertaining. Ken Mills is an awesome host too. Great stuff here. I wanna ROCK AND ROLL all night and listen to podkisst everyday. the team is on point with all things KISS. Great show for KISS fans. Ken Mills the "Podfather" and gang offer the best Kiss podcast going!!! There passion and knowledge is unmatched!!! A huge influence on my podcast and many others!!! Also check out Trick Chat for all thing Cheap Trick!!! Thank you for years of entertainment!!! This was the first podcast on the subject of KISS which I found interesting enough to subscribe to - I like the round table type discussions and open and honest reviews - this is a podcast you will revisit often - go grab a few episodes now! Have listened/followed this podcast since it originated. Should have reviewed sooner, but better late than never? If you are a Kiss fan, you will love this podcast. Celebrates all formations/evolutions of the band without alienating fans from any lineup. True fans of the band do the show, and they know their stuff! Also, have had some great interviews-even some of the band. Guaranteed to not disappoint. You wanted the best; you got the best, the hottest podcast on the net... PodKISSt! While there are several very good music related podcasts available, the PodKISSt is indeed the best. Ken, Gary and the gang treat the music with equal parts reverence and folly - as it should be. All eras are discussed and welcomed. Their positive attitude and support of other podcasts is also much appreciated. Thank you for all your hard work and dedication. It’ll make the good times great and the rough times better. It takes real talent to hold a listener's attention for 2 hours- this show is like a KISS show! Well this is it, if you are a member of this Army and don't listen to PodKISSt, then turn in your card and tshirt now! Led by the Podfather himself Ken Mills, these are all "powerful and attractive men". I honestly consider each and every member of this podcast to be unofficial members of KISS and of course part or Mr Starkeys "cabinet" if you will. KISS has been there for me in great times and bad, and every episode makes me feel like I'm right there with them discussing all these moments in my KISS fandom as well as there's, hopefully someday I can tell my own KISS story, hats off to podKISSt. Rock n roll all night.....CMON CMON, and party every day!!! It sounds like a conversation I would have about the band. Nothing smug or hip, just people who like the band having a discussion. I really like it when they do an episode on one side of one album, it helps me appreciate the record more. A must listen for the KISS fan! The PodKISSt podcast is one of the best KISS-centric shows out there. Maybe, even THE best. I love the roundtable disccussion from all the guys who take part, and it's always and enjoyable and informative listen. On a side note, as a Cheap Trick fan as well, the CHEAP TALK shows are equally great. Both shows are well worth your time and checking out! It's great to have an in-depth, well-executed podcast about the Hottest Band In The World. There is serious (and not-so-serious) discussion about EVERY facet of KISS, and for the most part, it is open-minded and impartial regarding the validity of different line-ups and releases! Thanks, guys! love the cheap trick episodes! PodKISSt was the very first KISS podcast that I started listening to back in mid/late 2011. It has since become my favorite KISS podcast of all the many great KISS podcasts (including THE KISS ROOM, my second favorite KISS podcast) that are currently in existence and one of it's hosts, Ken Mills a.k.a. The Podfather, is my current favorite podcaster as well. Matt Porter, host of THE KISS ROOM and a regular on PodKISSt and Cheap Talk with Trick Chat as well, is another standout. No matter how down in the dumps (and in need of "somethin' ta bring me up" as Paul Stanley would say) I may be, it's literally impossible for me not to smile from ear to ear whenever I hear Matt's voice. He is one of the most positive podcasters I've ever listened to as well as being a great host and participant on all of the other podcasts that he appears on. You wanted the best KISS podcasts and you got the best KISS podcasts right here. Well, except for the Cheap Trick stuff but that's just my opinion. I love KISS and I love this podcast. They keep it interesting and it's always a show I look forward to. Great cast of characters and Ken Mills does a GREAT Gene Simmons impersonation. He's a powerful and attractive man. a real standout kiss-related podcast! of all of the kiss-related podcasts, podkisst is a real standout! all of the guys are very well informed and are entertaining as hell to listen to. some of the best episodes are the ones where they will have hosts from the other kiss-related on the show. the episode with the kisstory science theater guys was amazing as was the episode with mitch lafon and the decibel geek guys. podkisst has also done some fantastic episodes with people who were in the kiss camp at one time or another. the adam mitchell, peter criss, jr. smalling, mick campise, bruce kulick, tod howarth, ace frehley, and bob kulick interviews have all been amazing. the "album focus" episodes are also real standouts! great work guys! This is a great Hub for Kiss news and talk. Love it! This podcast has it all; great hosts, cool guests, and amazing content. I look forward to listening to Ken, Gary, and all the great folks that they bring in. If you love KISS, you need to listen to the PodKISSt!!!! This is a very good podcast. It's both entertaining and informative. Kiss fans should definitely enjoy it. The opinions are honest, which is refreshing. The guys who put together the PodKISSt are not only die-hard Kiss fans, but lovers of great rock-&-roll in general. The podcast is "rough" - obviously done simultaneously from several locations, over the phone - but they aren't charging for it, so professional sound-quality takes a backseat to energy and passion. It's a labor of love, and that shines through in every episode. There's so much knowledge and trivia in each podcast, I learn something new every time, even though I'm a die-hard Kiss fanatic myself. They always reference "the other" Kiss podcasts that are out there, but this is the only one I subscribe to. Keep up the good work! These guys do a side-series of podcasts on Cheap Trick, and it's wonderful. Just rock music fans, sitting around, discussing great music--much like you do with your buddies. If you're a KISS fan this is the podcast for you! With a huge archive of shows built up there is quite a journey ahead for people just getting on board. From album breakdowns to interviews and a lot of surprises in between this is THE go to podcast for all things KISS. PodKisst is a cool podcast for Kiss fans. However, I like Kisstory Science Theater and Three Sides of the Coin better. In comparison, PodKissdt just lacks the depth, detail, and analysis of the other two mentioned. Also, PodKisst often features music that I've heard a million times before, and I'm more interested in discussion and exploring the music rather than listening to yet another live version of Dr. Love from 1977. 3 out of 5 stars for PodKisst. Excellent show, very informative. The entire staff are good people, on social media they're very personable. By far, the original go-to KISS podcast! Highyl Recommended! Rock and Roll all nite and Podkisst everyday! I thoroughly enjoy most episodes .... a great way to keep KISS on our minds on a regular basis. Ken, excellent interview with Jean Beauvoir! Great stories, some cool demo tracks, another fantastic episode of The PodKISSt! Podkisst is bringing the fun part of radio back! Via internet! Fun and informative to the Army that is KISS! AND....Great Tunes...cuz KISS ROCKS! There are quite a few KISS Podcasts to choose from. This one outshines the rest. Intelligent conversations. Sensible adulation and reasonable criticism of the band, it's history, songwriting, performances and various band members over the years. The Rock and Roll Over Roundtable Discussion Pts 1 and 2 and the ALIVE Discussion Part 1are good examples of what the show is about. Check them out! The original KISS Podcast and where it all started! Look forward to every episode! Great topics and great rare tracks! Simply put, the best KISS podcast out there. Long live the PodKISSt!! Regarding the Alive 2 podcast, I enjoyed hearing the thoughts from 3 different fans from as many decades. I myself have been a fan since 76 and Alive 2 was my first record. Being my first, I have to say its a sentimental favorite and as a guitar player it's one my favorite guitar tones they ever recorded. As far as it being an accurate portrayal of an evening with KISS that summer, it's obviously not so. But I believe it's never been the point to be accurate. It's more about the experience or illusion of a KISS show during that period. I love the performances from the sound check but I have to agree the doubling of Paul's voice throughout is annoying. It does destroy a bit of the illusion. Keep up the great work. Btw, I really enjoy the rare live performances. I suppose its a necessity but it works rather well. Ive listened to every one of their shows. AWESOME! Very informative and well done. Gary, Ken & company always come up with great topics. Thank you!